My latest book, Tapas, Sensational Small Plates from Spain is now available at your local book store and on line. I am going on the road with it, teaching classes, doing demos and book signings and even some TV. Here is a recent review. Not all cookbooks are created equal.As a veteran chef and author, Joyce Goldstein can pull a cookbook from the store shelf, select a random recipe and tell you — in a matter of seconds — if it will be a success or a failure. “The people writing them didn’t have experience, and they weren’t tested,” Goldstein said of the failed recipes many home cooks have encountered. When Goldstein works on a cookbook — and she’s written a slew of them — she guarantees every dish will be a success. “I pride myself in writing books where the recipes are well-tested. No one is going to call me at home hysterical because the recipe didn’t work,” she said. Goldstein will bring her cooking knowledge to New York and Vermont for a series of culinary events. Goldstein will be honored with a Spanish-style luncheon at noon Thursday at The Perfect Wife in Manchester Center, Vt. The author will take part in an interview-style program, moderated by chef Suvir Saran, at 7 p.m. Friday at Red Fox Books in downtown Glens Falls. She also will teach a class on Mediterranean cooking June 13 at the Battenkill Kitchen in Salem. Goldstein was the chef and owner of Square One in San Francisco, a highly acclaimed Mediterranean restaurant. Goldstein also served as chef at the Cafe at Chez Panisse in Berkeley, Calif., and was the founder of the California Street Cooking School. Goldstein had previously published a cookbook on Spain, but she wanted to create a book that focused on tapas, the Spanish appetizers that have gained international popularity. “I wanted to pick the best 50 or 60 tapas recipes I could do and make sure they were perfect, and I wanted to give a little background about Spain and Spanish ingredients,” Goldstein said. The book offers recipes on dishes ranging from Galician double-crusted pie with a fish or meat filling to grilled green onions, artichokes and asparagus with salsa romesco. Goldstein wanted the book to present a more authentic view of tapas than what is served in many American restaurants. “There are all sorts of American dishes that people are calling tapas. A lot of people call things tapas that have nothing to do with Spain, they just serve them on small plates,” she said. Goldstein believes the tapas trend eventually will become a staple rather than a fad in American cuisine. When it comes to dining out, tapas dishes allow diners to get experimental with little risk. “If you order an entrée in a restaurant and you don’t like it, you are out $25 to $30 bucks,” she said. In addition to the influence of serving sizes at restaurants, the Spanish flavors of tapas are beginning to appear in contemporary American dishes. “Years ago, you couldn’t get a lot of Spanish ingredients. I think that is why it took so long for Spain to come into people’s homes,” she said. Today, hints of Spanish flavor are becoming common in American recipes and restaurant dishes, according to the chef. “I think Americans are a little more adventurous. Even if it gets watered down, they are getting the flavors,” she said. For Goldstein, writing cookbooks is as much about changing people’s food philosophies as it is about creating step-by-step instructions for specific dishes. Goldstein’s previous book, “Mediterranean Fresh: A Compendium of One-Plate Salad Meals and Mix-and-Match Dressings,” focused on the versatility of Mediterranean dressings as marinades and finishing sauces. In “Solo Suppers: Simple Delicious Meals to Cook for Yourself,” Goldstein was on a mission to show people that it is possible to live alone and eat well. “I think you can cook wonderfully for yourself. I live alone, and I cook for myself,” she said. The book was inspired by her own frustration with trying to work with recipes written to serve four to six people. “I don’t want to eat something four days in a row,” she said. Although some recipes can be scaled down, others don’t convert as easily. 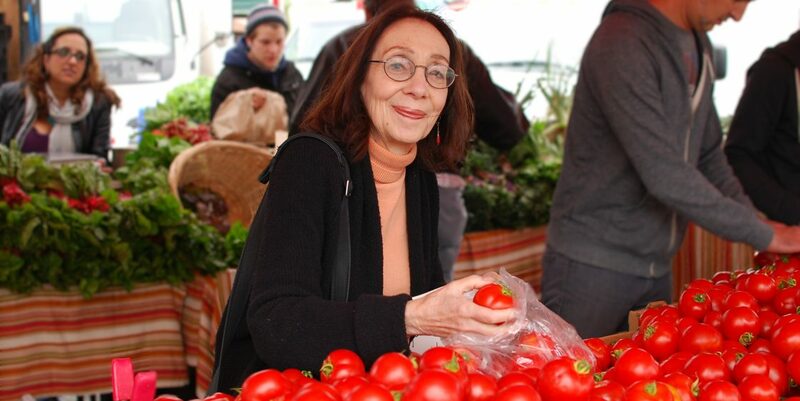 Goldstein wanted to write a book that would empower single people to get back in the kitchen. “I really believe we eat better if we cook for ourselves. We get a better quality of ingredients with less preservatives and garbage,” she said. Goldstein has found that eating by yourself doesn’t have to be a lonely experience. While looking for a recipe using pomegranate molasses, I pulled your book, The Mediterranean Kitchen off my bookshelf and found a great recipe-Middle Eastern Pork with Pomegranate and Honey. All the recipes in this book look wonderful and I was curious to see if you had any new books out. I searched online and found your blog. Not only was I thrilled with the new cookbooks, but enjoyed reading your thoughts on the demise of home cooking, how you were frustrated with recipes that served 4 to 6 people, and that we would eat better if we cooked for ourselves. I cook all our meals and we rarely eat out except when we travel. Your Tapas book and Solo meals book are two cookbooks I will definitely buy. Thanks. Hi ? very good site you have created. I enjoyed reading this posting. I did want to write a remark to tell you that the design of this site is very aesthetically pleasing. I used to be a graphic designer, now I am a copy editor. I have always enjoyed working with computers and am trying to learn code in my spare time.